Christian BOLTANSKI: L'Enterreur et Autres Poèmes by Oliven Sten. 1966. Front and back cover with illustrations by C. Boltanski. Editions Jean-Pierre Oswald, Paris, F., 1966. First edition. J. Flay: C. Boltanski, Catalogue of the books, Printed Matter, Ephemera, König 1992, n° 1, p. 5. Bob Calle: Christian Boltanski, Livres d'artiste 1969-2007, Paris, 2008, p. 125. 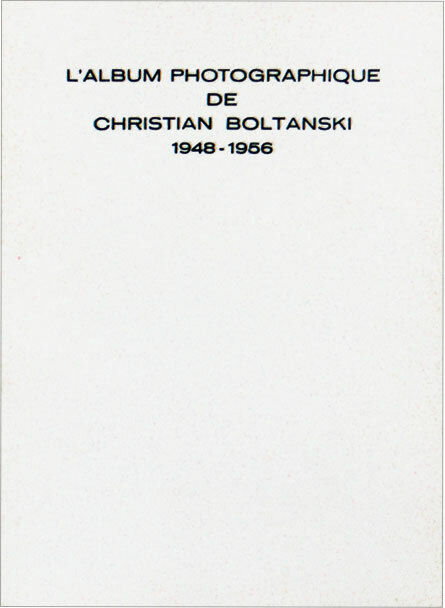 Christian BOLTANSKI: Recherche et présentation de tout ce qui reste de mon enfance, 1944-1950. 1969. Artist book. Mail art piece. 9 unpaginated sheets of white paper printed on one side, bound with a clear plastic clip. 15 b/w photos printed black offset without grid. In a white paper envelope, 28.2 x 20.9 cm with text "Christian Boltanski Au "201, Boulevard Saint-Germain, Paris-VIIe" printed in black on the front. (Ed. "Au 201 Bd St Germain"= Ed. Givaudan), Paris, (Mai 1969). Edition of 150 copies. 1st edition, which is the only one to contain the Boltanski's text: "On ne remarquera jamais assez que la mort est une chose honteuse...", typed inside the first sheet. 1st CB's artist book. True first edition. J. Flay: C. Boltanski, Catalogue of the books, Printed Matter, Ephemera, König 1992, n° 3, pp. 8-11. Bob Calle: Christian Boltanski, Livres d'artiste 1969-2007, Paris, 2008, pp. 12-13. Christian BOLTANSKI: Reconstitution d'un accident qui ne m'est pas encore arrivé et où j'ai trouvé la mort. 1969. 6 unpaginated sheets of white paper printed on one side, bound with a clear plastic clip. 12 b/w photos printed black without grid. Ed. "Au 201 Bd St Germain" (Ed. Givaudan), Paris, November 1969. Edition of 150 copies. True first edition. J. Flay: C. Boltanski, Catalogue of the books, Printed Matter, Ephemera, König 1992, n° 6, pp. 16-19. Bob Calle: Christian Boltanski, Livres d'artiste 1969-2007, Paris, 2008, pp. 14-15. 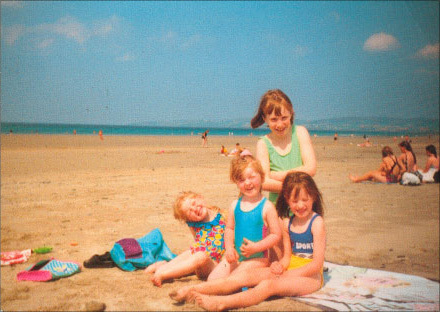 Christian BOLTANSKI: Photographie de ma petite soeur en train de creuser sur la plage de Granville. 1969. A b/w photo showing a young girl digging sand at the beach. J. Flay: C. Boltanski, Catalogue of the books, Printed Matter, Ephemera, König 1992, n° 7, pp. 20-21. 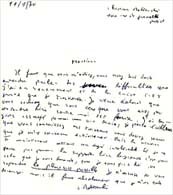 Christian BOLTANSKI: Lettre manuscrite demandant de l'aide. Christian Boltanski, 100 rue de Grenelle, Paris, 7è. Monsieur, Il faut que vous m'aidiez..." 1970. Text in French handwritten in blue ballpoint on white paper. 19 lines all together, including the signature, on one side. It was mailed folded in four but has been kept flat since then. January 11th, 1970. J. Flay: C. Boltanski, Catalogue of the books, Printed Matter, Ephemera, König 1992, n° 9 pp. 24-25. Christian BOLTANSKI: Local III. Christian Boltanski 47 rue Rémy Dumoncel Paris 14 1er étage, porte face. 1970. White paper shipping label. On one side, usual printed text on shipping labels, on the other one, handwritten by CB in blue ballpoint, the text "Local III. Christian Boltanski 47 rue Rémy Dumoncel Paris 14 1er étage, porte face". Uncomplete: this label should be attached to a key with a piece of string. Both key and string piece are lacking. March 1970. Sent to 60 people. J. Flay: C. Boltanski, Catalogue of the books, Printed Matter, Ephemera, König 1992, n° 10, pp. 28-29. Christian BOLTANSKI: Les documents photographiques qui suivent m'ont été transmis par Louis Caballero. (Tout ce que je sais d'une femme qui est morte et que je n'ai pas connue). 1970. Unpaginated, (12)p. including the covers. 5 b/w photos ("Image I, II, II, IV, V") with text, caption on the facing page. 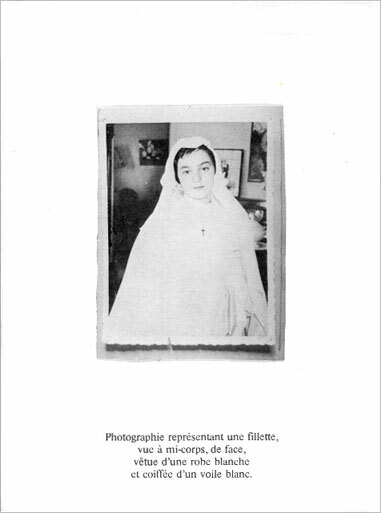 Although known as "Tout ce que je sais d'une femme qui est morte et que je n'ai pas connue", the only title featuring on the book is "Les documents photographiques qui suivent m'ont été transmis par Louis Caballero". Self-published, Paris, 1970. First edition. J. Flay: C. Boltanski, Catalogue of the books, Printed Matter, Ephemera, König 1992, n° 11, pp. 30-31. Bob Calle: Christian Boltanski, Livres d'artiste 1969-2007, Paris, 2008, pp. 16-17. Christian BOLTANSKI: Christian Boltanski à 5 ans 3 mois de distance. 1970. 1 original b/w photo, showing 2 CB photo portraits on an index card. J. Flay: C. Boltanski, Catalogue of the books, Printed Matter, Ephemera, König 1992, n° 14, pp. 36-37. Christian BOLTANSKI: Projet pour Chorus. In Chorus 5/6 "La Ville", September 1970. Original work in four (4) b/w offset photos. Boltanski's contribution, pages 30-33, to issue #5/6 of Chorus titled "La Ville", Paris, September 1970. Photos titles: "Image 1", "Image 2", "Image 3", "Image 4". J. Flay: C. Boltanski, Catalogue of the books, Printed Matter, Ephemera, König 1992, n° 15, pp. 38-39. 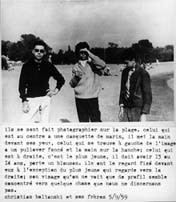 Christian Boltanski et ses frères 5/9/59. 1970. 1 original b/w photo (photo-montage) showing on the upper part 3 young boys, and, on the lower part, a text in French: "ils se sont fait photographier sur la plage. celui qui est au centre a une casquette de marin...". J. Flay: C. Boltanski, Catalogue of the books, Printed Matter, Ephemera, König 1992, n° 16, p. 40-41. Christian BOLTANSKI: Reconstitution de gestes effectués par Christian Boltanski entre 1948 et 1954. 1970. 12p. (7 b/w offset photos). (Selfpublished), (Paris), (November 1970). True first edition. Edition of 500 unnumbered copies of which some are signed on the back cover. One of these signed copies. Photos have been taken by Sarkis November 8, 1970. J. Flay: C. Boltanski, Catalogue of the books, Printed Matter, Ephemera, König 1992, n° 17, pp. 42-45. Bob Calle: Christian Boltanski, Livres d'artiste 1969-2007, Paris, 2008, p. 17. One of the unsigned copies. A small white index card with the word "Maladie" ("illness") printed in blue ink in the center. J. Flay: C. Boltanski, Catalogue of the books, Printed Matter, Ephemera, König 1992, n° 18, pp. 46-47. Christian BOLTANSKI: Catalogue: Essais de reconstitution d'objets ayant appartenu à Christian Boltanski entre 1948 et 1954. 1971. Galerie I. Sonnabend, Paris, 23 Mars 1971. True first edition. J. Flay: C. Boltanski, Catalogue of the books, Printed Matter, Ephemera, König 1992, n° 19, pp. 48-51. Bob Calle: Christian Boltanski, Livres d'artiste 1969-2007, Paris, 2008, p. 18. Christian BOLTANSKI: Reconstitution de Chansons qui ont été Chantées à Christian Boltanski de 1946 à 1948. 1971. 45rpm vinyl record, two sides in a card envelope. Two French lullabies and a Breton folksong: Side 1: "Fais dodo Colas mon petit frère", Side 2: "Il était un petit navire" and "Sainte Elizabeth". 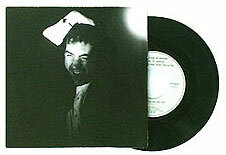 On the front cover of the envelope is mounted an original b/w photo by Boltanski. Dated 2.5.72 and signed by Boltanski in black pencil on the back cover. This copy was specially made to be given as a birthday present to a gallery owner in Paris. - The Record as Artwork, from Futurism to Conceptual Art, The collection of Germano Celant, 1978, p. 81 & 87, 102, 113, dated 1972. - Boltanski, les Modèles, Cheval d'Attaque, 1979, p. 14 in the bibliography, dated June 1971. - Catalogue "d.i.s.c.o.t.h.e.q.u.e. ... experiences sonores d'artistes", Maison du Livre, de l'Image et du Son, Ville de Villeurbanne, Oct.-Nov. 1989, dated 1972. - J. Flay: C. Boltanski, Catalogue of the books, Printed Matter, Ephemera, König 1992, n° 23, pp. 58-59, dated June 1971. - Bob Calle: Christian Boltanski, Livres d'artiste 1969-2007, Paris, 2008, pp. 20-21. 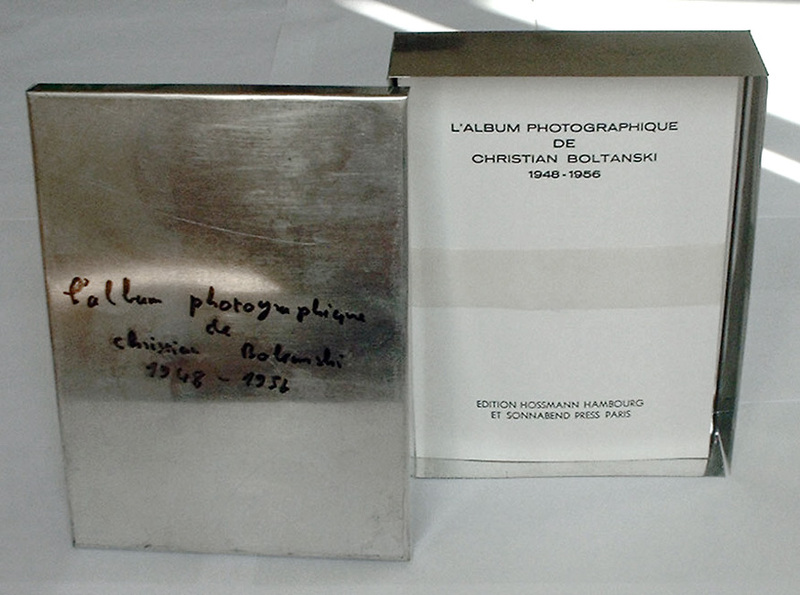 Christian BOLTANSKI: L'Album photographique de Christian Boltanski, 1948-1956. 1972. (32)p./pl. 32 b/w offset photographs by Annette Messager. Text in French + (8) inserted pages, translation into English and German. Hossmann, Hamburg, Sonnabend Press, Paris, 1972. True first edition. Edition of 500 copies + 60 Deluxe + 10 H.C. One of the 500. J. Flay: C. Boltanski, Catalogue of the books, Printed Matter, Ephemera, König 1992, n° 27, pp. 70-73. Bob Calle: Christian Boltanski, Livres d'artiste 1969-2007, Paris, 2008, pp. 24-25. One of the 60 copies of the Deluxe edition. Housed in the original metal box. Handwritten title by C. Boltanski in black felt pen on the lid. 1 title page; 32 b/w original photographs by Annette Messager mounted on 32 white card board plates, text (captions below the photographs) in French and 2 loose 4-page leaflets, translation into English and German. Loose, wrapped in a white paper band, as issued. Plates 21.4 x 15 cm. 22.3 x 16.1 x 5.2 cm. Hossmann, Hamburg, Sonnabend Press, Paris, 1972. Total edition: 500 copies + 60 Deluxe + 10 H.C. This copy, one of the Deluxe 60, numbered 37/60. 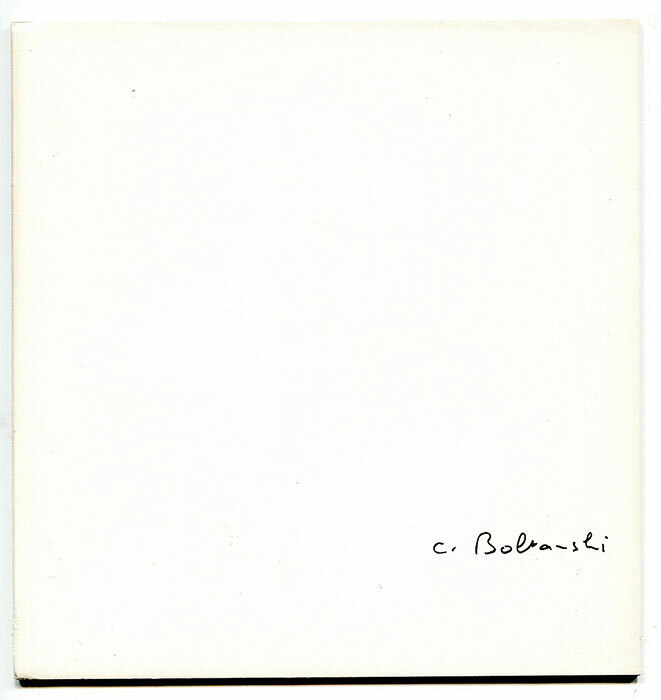 Signed and numbered by C. Boltanski in the colophon plate. Condition: as new, the box comes with the original wrapping paper. Christian BOLTANSKI: 10 portraits photographiques de Christian Boltanski 1946-1964. 1972. (20)p./pl. 10 b/w offset photos by Annette Messager. Multiplicata, Paris, France, 1972. Edition of 500 signed copies. True first edition. J. Flay: C. Boltanski, Catalogue of the books, Printed Matter, Ephemera, König 1992, n° 28, pp. 74-77. Bob Calle: Christian Boltanski, Livres d'artiste 1969-2007, Paris, 2008, pp. 26-27. Christian BOLTANSKI: Inventaire des objet appartenant à un habitant d'Oxford précédé d'un avant-propos et suivi de quelques réponses à ma proposition. Verzeichnis der Objekte, die einem Einwohner Oxford's gehören eingeleitet durch ein Vorwot und gefolt von einigen Antworten auf meinen Vorschlag/Inventory of the objects belonging to an inhabitant of Oxford introduced by a preface and followed by some answers to my proposal. 1973. (80)p., 344 b/w offset photos by P. Ibsen. Westfälischer Kunstverein, Munster, (1973). True first edition. J. Flay: C. Boltanski, Catalogue of the books, Printed Matter, Ephemera, König 1992, n° 31, pp. 88-91. Bob Calle: Christian Boltanski, Livres d'artiste 1969-2007, Paris, 2008, pp. 32. Christian BOLTANSKI: L'Appartement de la rue de Vaugirard. 1973. (12)p./pl. 10 b/w photos. Texts in French by C. Boltanski. Self-published, Paris, 1973. True first edition. J. Flay: C. Boltanski, Catalogue of the books, Printed Matter, Ephemera, König 1992, n° 32, pp. 92-93. Bob Calle: Christian Boltanski, Livres d'artiste 1969-2007, Paris, 2008, pp. 30-31. Christian BOLTANSKI- Jean LE GAC- Annette MESSAGER. Musée Rude, Dijon, 1973. 75p./pl. Text in French by Marianne Lemoine. - C. Boltanski: "5 brouillons de C. Boltanski, Mars-Mai 1973". - A. Annette Messager artiste: "Le travaux de l'atelier, Annette Messager collectionneuse: Les travaux de la chambre. Sur les travaux de l'atelier". For the collective show at the Musée Rude, Dijon, France, 1973, curated by Serge Lemoine. Christian BOLTANSKI: A la Fenêtre. 16 mm film. 1973. 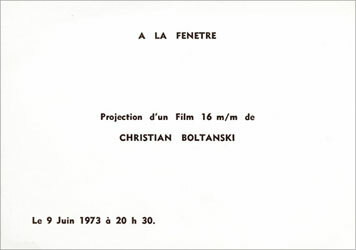 For the projection of the 16 mm film "A la Fenêtre", at Ben (Vautier) and Annie's, Nice, France, June 09, 1973. Les Modèles, Cheval d'Attaque, Paris, 1979, p. 3 of the bibliography, films section. Christian BOLTANSKI: Inventaires de Christian Boltanski. 1973. (72)p./pl. B/w illustrations. Texts in French by J. & J., "All for Arts". Biography and texts in French and Hebrew. Exhibition September-October, 1973. Musée d'Israel, Jeruslaem, 1973. 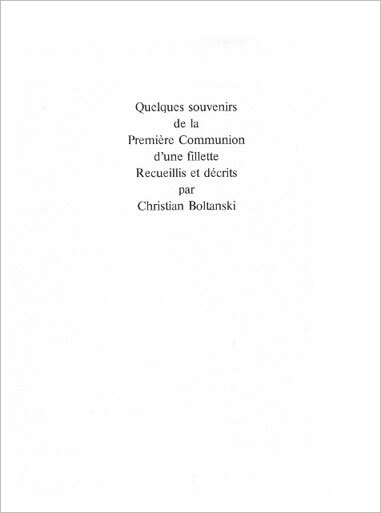 Christian BOLTANSKI: Quelques souvenirs de la Première Communion d'une fillette recueillis et décrits par Christian Boltanski. 1974. Original maquette of the artist book. 3 sheets of strong white paper folded in two, forming 12 pages/plates and covers. The texts, in French, are at the same time both handwriten in black pencil on the strong paper and typed (with hand corrections) on loose small pieces of white light paper to be mounted on the handwritten ones. 9 original b/w photos, mounted on the plates. 12 pages/plates. 9 illustrations. Stapled bound. Edition of 150 copies, numbered and signed by the artist. True first edition. J. Flay: C. Boltanski, Catalogue of the books, Printed Matter, Ephemera, König 1992, n° 35, pp. 98-99. Bob Calle: Christian Boltanski, Livres d'artiste 1969-2007, Paris, 2008, pp. 34-35. 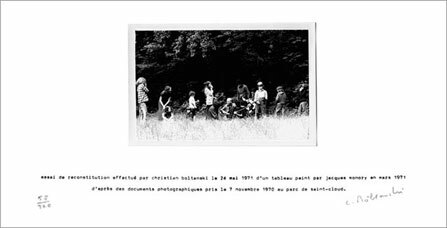 Christian BOLTANSKI: Essai de Reconstitution Effectuée par Christian Boltanski le 24 Mai 1971 d'un Tableau Peint par Jacques Monory en Mars 1971 d'après des documents photographiques pris le 7 Septembre 1970 au Parc de Saint-Cloud. 1974. In March 1971, Monory reconstitues in a painting photographic documents taken seven months earlier, in September 1970. Three months later, in May 1971, Boltanski reconstitues this Monory's painting (therefore also the original image from 1970) in a photo. The reconstitution of a reconstitution. The two artists share the same plate (34.8x34.8 cm) distributed in two horizontal halves. Each work is numbered and signed by the artist, in an edition of 120 copies. J. MONORY: Untitled: Black and blue silkprint. 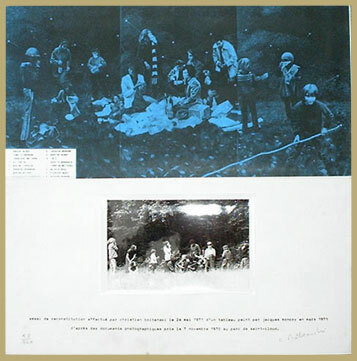 Names of the characters in the photo into a small rectangular caption, lower right corner: S. Gligo; C. Espagne; F. Boltanski; G. Fortin; M. Espagne; A. Granmore; M. Meziere; J. Monory; M. Barat; Jim X; A. Messager; C. Boltanski; O. Segui; S. Barat; A. Monory. 17.4x34.8 cm (of 34.8x34.8 cm). Pasted on the cardboard plate. "Chorus" blind stamp in the lower left corner. Numbered and signed in black pencil by Monory. Original b/w mounted photo and typed text (see title), on a sheet of white paper pasted on the carboard plate. 17.4 x 34.8 cm (of 34.8 x 34.8 cm). "Chorus" blind stamp in the lower left corner. Numbered and signed in black pencil by Boltanski. Boltanski, Les Modeles, p. 20 of the bibliography. Paris, Cheval d'Attaque, 1979. Christian BOLTANSKI: Inventaire des Objets ayant appartenu à une femme de Bois-Colombes. 1974. CNAC, Paris, F., 1974. True first edition. J. Flay: C. Boltanski, Catalogue of the books, Printed Matter, Ephemera, König 1992, n° 38, pp. 106-109. Parr and Badger, The Photobook Volume 2, p. 154-155. Bob Calle: Christian Boltanski, Livres d'artiste 1969-2007, Paris, 2008, pp. 38-39. Christian BOLTANSKI: Saynètes comiques: The Birthday. 1974. 5: "It's time, I blow out the candles". Each photo: 29.7 x 20.4 cm. Original black wooden frame and plexiglas panel. Total size: 37.90 x 112.60 cm. Referenced in the Boltanski Archives under #0369.3. Shows: "Saynètes comiques", Sonnabend Gallery, New York, NY, 1974; "Eremit? Forscher? Sozialarbeiter? ", Kunstverein and Kunsthaus Hamburg, Germany, 1979. Provenance: Galerie Crousel-Hussenot, Paris; Private collection. Christian BOLTANSKI: Quelques Interprétations par Christian Boltanski. 1974. CNAC, Centre Nat. d'Art Contemp., G. Pompidou, Paris, 1974. Edition of 200 signed and numbered copies. J. Flay: C. Boltanski, Catalogue of the books, Printed Matter, Ephemera, König 1992, n° 39, pp. 110-111. 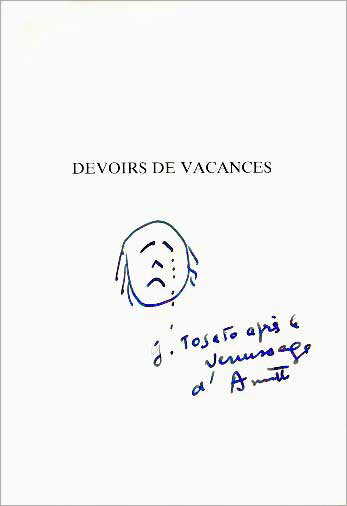 Bob Calle, Christian Boltanski, Livres d'artistes 1969-2007, 2008, pp. 39. 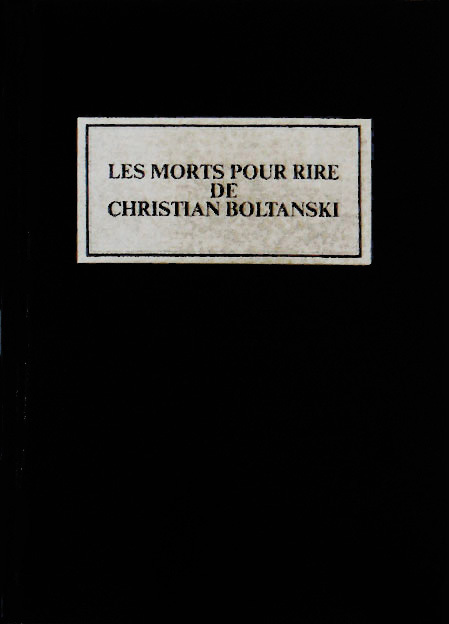 Christian BOLTANSKI: Les Morts pour Rire. 1974. 14 b/w tipped-in photographs printed from the negative. Hardcover. Black cloth-covered boards.Title printed in white on the spine. Inside a black cloth-covered slipcase. First edition of 170, of which 20 Deluxe copies. 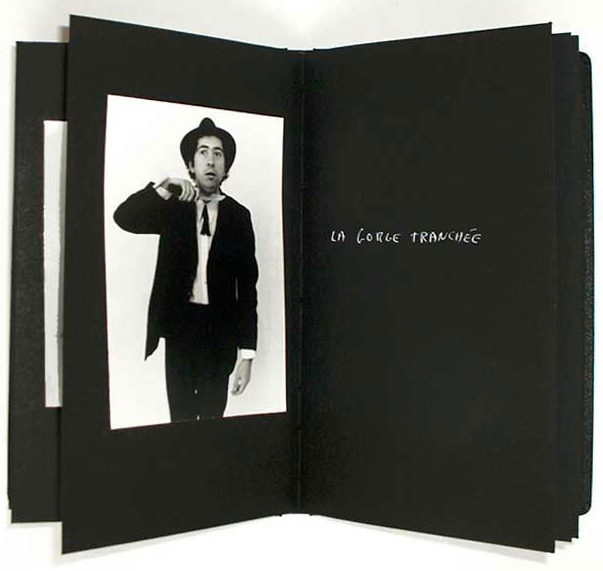 This copy is one of the Deluxe 20, with 14 mounted photographs and 8 texts handwritten in white ink by C. Boltanski. (In the 150 copies of the normal edition, the photographs are reproduced offset and the text is printed in French, English, German). Les Modèles, Cheval d'Attaque, Paris, 1977, p. 32. J. Flay: C. Boltanski, Catalogue of the books, Printed Matter, Ephemera, König 1992, n° 40, pp. 112-115. Bob Calle: Christian Boltanski, Livres d'artiste 1969-2007, Paris, 2008, pp. 40 & 41. Christian BOLTANSKI: Les morts pour rire de Christian Boltanski. Deads in fun. Die sich zum Spass Umbringen. 1974. 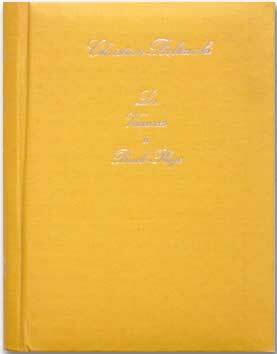 Three-language French-English-German text by C.B. AQ, Dudweiler, 1974. True first edition. Edition of 150 copies + 20 numbered and signed copies. One of the 150. Thin white vertical white crease along the back cover joint. VG+/Fine. Bob Calle: Christian Boltanski, Livres d'artiste 1969-2007, Paris, 2008, pp. 40-41. Christian BOLTANSKI: 20 Règles et Techniques utilisées en 1972 par un enfant de 9 ans décrites par Christian Boltanski. 20 regler og teknikker anvendt i 1972 af et barn pa 9 ar skildret af Christian Boltanski. 1975. 48+101 offset b./w. photos. Bilingual Danish-French text (captions and table of contents). Berg, Copenhagen, Denmark, 1975. Edition of 600 numbered copies. True first edition. J. Flay: C. Boltanski, Catalogue of the books, Printed Matter, Ephemera, König 1992, n° 41, pp. 116-119. A. Moeglin-Delcroix, Esthétique du livre d'artiste, p. 218, 369. Bob Calle: Christian Boltanski, Livres d'artiste 1969-2007, Paris, 2008, pp. 42. Christian BOLTANSKI: Souvenirs de jeunesse interprétés par Christian Boltanski. 1975. 22p. (10 b/w offset photos). A. Cuberyan, Salle Palatiño, Geneva, Switzerland, (February 1975). True first edition. J. Flay: C. Boltanski, Catalogue of the books, Printed Matter, Ephemera, König 1992, n° 42, pp. 120-121. Bob Calle: Christian Boltanski, Livres d'artiste 1969-2007, Paris, 2008, p. 44. Christian BOLTANSKI: Le Papa Bricoleur. 1975. Köning, Schenkung Christian Boltanski No 107. 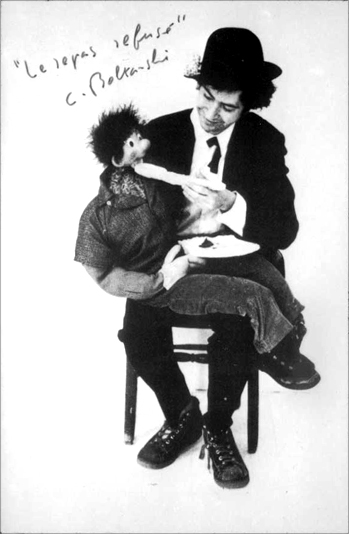 Christian BOLTANSKI: Le Repas Refusé. 1975. Köning, Schenkung Christian Boltanski No 108. Christian BOLTANSKI: 4 Saynètes comiques interprétées par Christian Boltanski. 1975. Gal. Suvremene Umjetnosti, Zagreb, Croatia, 1975. (First publication of the "Saynètes comiques", then exhibited and published, differently, for the group show "12x1", October, 1975, Palais des Beaux-Arts, Brussels): "Le baiser surpris"; "Les bonnes notes"; "Le baiser honteux"; "La toilette du matin". Edition of 500 unnumbered copies. True first edition. J. Flay: C. Boltanski, Catalogue of the books, Printed Matter, Ephemera, König 1992, n° 44, pp. 124-125. Bob Calle: Christian Boltanski, Livres d'artiste 1969-2007, Paris, 2008, pp. 46-47. 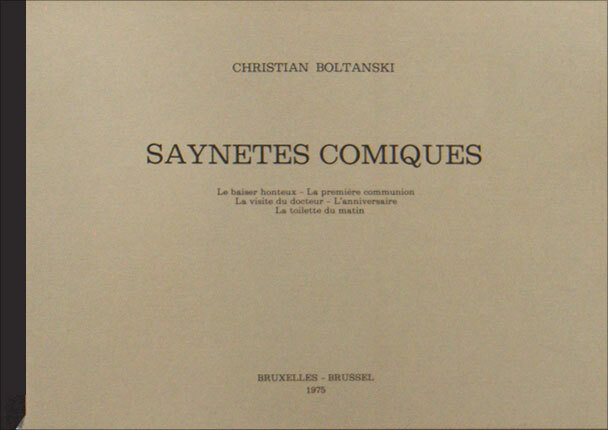 Christian BOLTANSKI: Saynètes comiques. 1975. 32 offset phot plates, captions in French. Contents: Le baiser honteux - La première communion - La visite au docteur - L'anniversaire - La toilette du matin. Palais des Beaux-Arts, Brussels, Belgium, 1975. True first edition. J. Flay: C. Boltanski, Catalogue of the books, Printed Matter, Ephemera, König 1992, n° 45, pp. 126-129. Bob Calle: Christian Boltanski, Livres d'artiste 1969-2007, Paris, 2008, p. 43. Christian BOLTANSKI: Christian Boltanski le Furieux. 1975. Franca Mancini, Pesaro, Italy, 1975. Edition of 100, numbered and signed. J. Flay: C. Boltanski, Catalogue of the books, Printed Matter, Ephemera, König 1992, n° 46, p. 131. Christian BOLTANSKI: Photographies couleurs. Extrait d'une lettre envoyée de Berlin en Août 1975 par Christian Boltanski à Guy Jungblut. 1976. A sheet of white paper printed black offset on both sides. Invitation to the show "Images Modèles", MNAM, salle audiovisuelle, Paris, May 19-24, 1976. J. Flay: C. Boltanski, Catalogue of the books, Printed Matter, Ephemera, König 1992, n° 48, pp. 134-135. Christian BOLTANSKI: Tout ce que je fais c'est de l'art, puisque je suis un artiste. 1976. In: Facade, # 1, Paris, (June, 1976). Monthly magazine. (14)p. of which 2 pages with offset photos and an original text in English by C. Boltanski. J. Flay: C. Boltanski, Catalogue of the books, Printed Matter, Ephemera, König 1992, n° 50, pp. 138-139. Christian BOLTANSKI / MESAGER, Annette: Modellbilder. 1976. Texts by C.B. Rüger, L. Romain, K. Honnef. Christian BOLTANSKI: Saint Pierre en Port 1935: Sur la plage après le bain / Vallée d'Eletot, Grand Pré, en allant aux noisettes. c.1977. 2 black and white original photos, each mounted on a brown cardboard card. On one side, the photo is framed with a black ink line, with handwritten title. 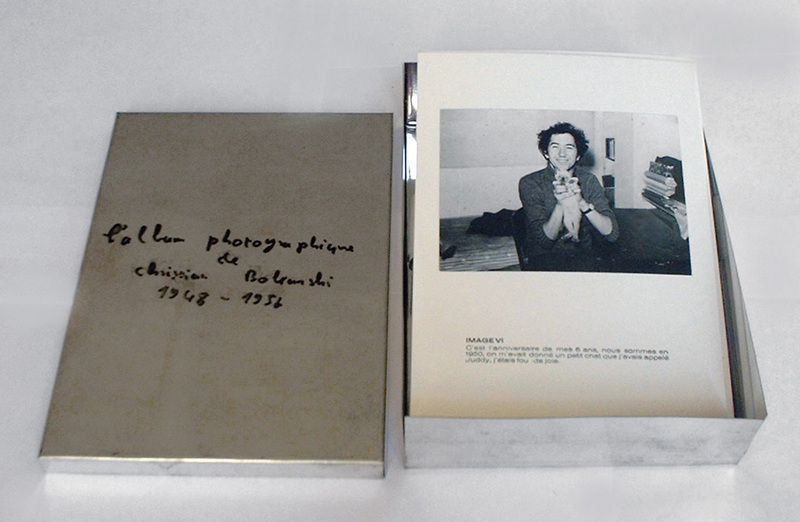 On the other side, second title and the rubber stamp by Boltanski: "Photo n'ayant jamais appartenu à ni vu par Christian Boltansky" (photo having never been owned nor seen by Christian Boltanki). Each of these photos from 1935 was found somewhere by CB, but of course, not taken by him. Card: 13.7 x 8.9 cm. Photo: 5.9 x 8.3 cm; 8 x 5.4 cm. Each of them comes in a transparent paper bag sealed with a scotch tape piece. Created for the Spoerri's "Boutique Aberante" at Centre Pompidou, Paris, 1977. Christian BOLTANSKI: Petit agenda trouvé par Christian Boltanski en 1974. c. 1977. A transparent thin rodoid cylindar box with lid containing an opened agenda, found somewhere by Boltanski, mounted on the bottom, inside the box. 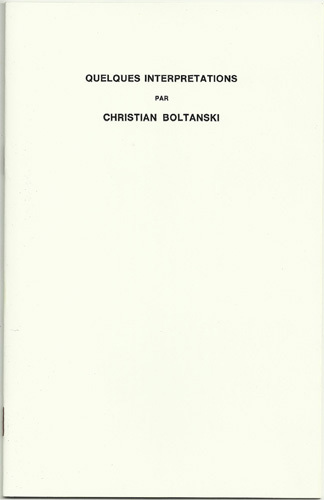 On the front cover of the agenda, a small white paper label with title handwritten in blue ink by Boltanski: "Petit agenda trouvé par C. Boltanski en 1974". Some of the pages inside have anonymous texts. Agenda: approx. 10.5 x 6 cm. Box: 6.5 cm high, diameter: 12 cm. 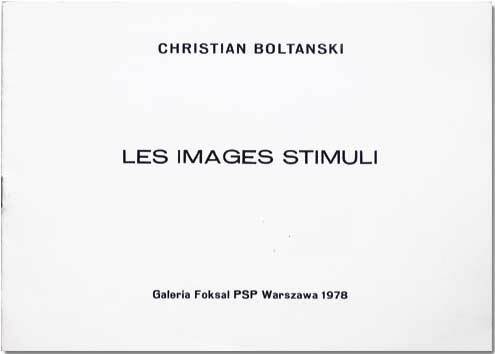 Christian BOLTANSKI: Les Images Stimuli. 1978. 12 pages + 14 b/w offset photos. Foksal, Varsaw, Poland, 1978. Edition of 500 unnumbered copies. First edition. J. Flay: C. Boltanski, Catalogue of the books, Printed Matter, Ephemera, König 1992, n° 52, pp. 144-145. Bob Calle: Christian Boltanski, Livres d'artiste 1969-2007, Paris, 2008, p. 48. 123 pages/plates. Text in French by A. Franzke. Badischer Kunstverein, Kalrsruhe, Germany and Le Chêne, Paris, France, 1978. J. Flay: C. Boltanski, Catalogue of the books, Printed Matter, Ephemera, König 1992, n° 53, pp. 146-147. Christian BOLTANSKI: Les Modèles. Cinq relations entre texte et images. 1979. 64+(1)+44+(1)pages, profusely illustrated. Texts in French. Interview with I. Lebeer; Recherche et présentation de tout ce qui reste de mon enfance; Tout ce que je sais d'une femme qui est morte et que je n'ai pas connue; L'appartement de la rue de Vaugirard; Les portraits photographiques de C.B. ; LES HISTOIRES (unpublished at the time). Very important biography and bibliography (first attempt of catalogue raisonne of Boltanski' books and publications). Cheval d'Attaque, Paris, F., 1979. 1st edition. Not in the "Catalogue", except "Les Histoires", #33, pp. 94-95 and #53, p. 147. Christian BOLTANSKI: Souvenirs de Jeunesse. 1979. 4 p. and 12 b/w illustrations. After a movie by Jacques Pamart. Images by Jennifer Gough-Cooper and Jacques Caumont, text by Christian Boltanski. 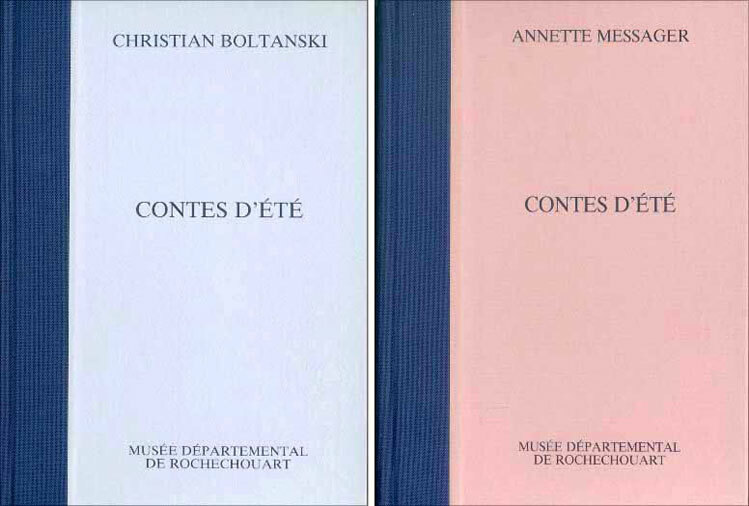 Published on the occasion of the show "Boltanski, oeuvres de 1974-1975", Centre Culturel Communal de Saint Pierre-des-Corps. Dedication copy, signed by artist. J. Flay: C. Boltanski, Catalogue of the books, Printed Matter, Ephemera, König 1992, n° 54, pp. 148-149. 45p./colored pl. Intyerview S. Pagé / Boltanski; postface by D. Viéville. Biography. Paris, ARC, Musée d'Art Moderne de la Ville de Paris, 1981. Christian BOLTANSKI: Lanterne magique. 1982. Leporello. 4 b/w illustrations, a coloredone on the front cover. Unfolded: 10.5 x 59.3 cm. Folded: 10.5 x 15 cm. Published on the occasion of the show, March 4-29, 1982. De Vleeshal, Mideelburg, 1982. Edition of 250 copies. Bob Calle: Christian Boltanski, Livres d'artiste 1969-2007, Paris, 2008, p. 49. (COLLECTIVE). BERTRAND, BOLTANSKI, BUREN, LAVIER, SARKIS: La France à la Biennale. 1985. Vinyl sound disc (33 1/3 rpm) + booklet. Booklet: (16)p., including paper covers. 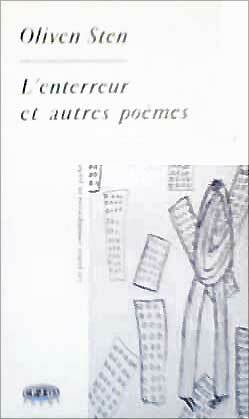 Parallel text in French, English and Protuguese by M. Nuridsany. Stapled bound. Loose, inside the record sleeve gatefold. Condition: Water stains on the upper right corner of the front cover and first page.Condition: Water stains on the upper right corner of the front cover and first page. Disc: Diameter 25 cm, in gatefold sleeve, 26x26 cm. Christian Boltanski: Reconstitution de chansons qui ont été chantées à Christian Boltanski entre 1944 et 1946. Jean-Pierre Bertrand: Un camion freine - Voiture de police - La musique passe, 1985. Association Française d'Action Artistique (AFAA), Paris, 1985. 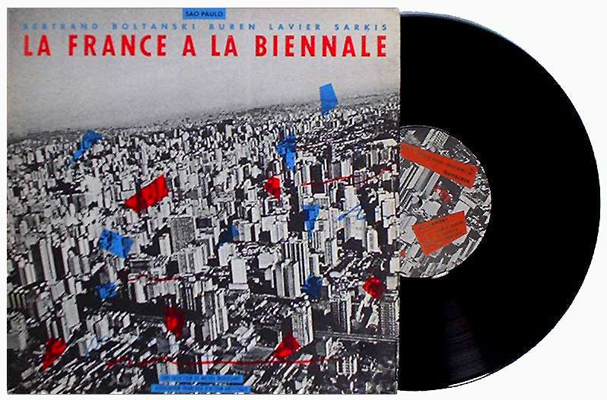 Published on the occasion of the show organized as part of the 18th Bienal Internacional de Sao Paulo, Brazil, 1985. Condition: wear at sleeve corners and on the back; record excellent. British National Art Library, ref. NL.93.0829. Actes Sud, Le Méjan, Arles, F., 1999. 1st edition. Bob Calle: Christian Boltanski, Livres d'artiste 1969-2007, Paris, 2008, p. 61. 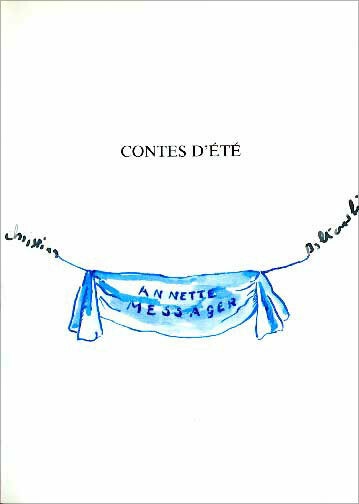 Christian BOLTANSKI / Annette MESSAGER: Contes d'Eté. 1990. Two volumes: A.M.: (30)p., b/w and colored illustrations; C.B. : (28)p., tipped-in offset colored photos. Text in French by G. Tosatto. Twin volume, hardbound, in a card slipcase. Musée Départemental de Rochechouart, France, 1990. Dedication copy to Guy Tosatto (former director of the Musée de Rochechouart, then of the Centre Pompidou, Paris) by C. Boltanski: text on the title page of one volume; drawing on the title page of the other one. J. Flay: C. Boltanski, Catalogue of the books, Printed Matter, Ephemera, König 1992, n° 72, pp. 190-191. 31.5 x 26 x 3.5 cm. Reconstitution (foreword by Catherine Lampert, Jan Debbaut, Serge Lemoine and an essay by Lynn Gumpert in English: "The many faces of Christian Boltanski") / Interview G. Marsh - C. Boltanski in English. 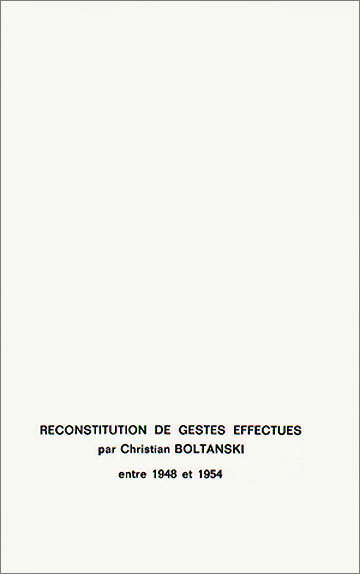 C. Boltanski reprints: Reconstitution de gestes effectués par C.B. entre 1948 et 1954 / 10 Portraits de C.B. 1946-1964 / Recherche et présentation de tout ce qui reste de mon enfance / Inventaire des objets ayant appartenu à une femme de Bois-Colombes / Saynètes comiques / Lettre de demande d'aide / Lettre aux conservateurs de musées... / Dispersion à l'amiable / C.B. a l'honneur de vous faire ses offres de services / C.B. à 5 ans 3 mois de distance / C.B. et ses frères / 3 colored postcards/ 1 colored poster "L'Ange d'Alliance". 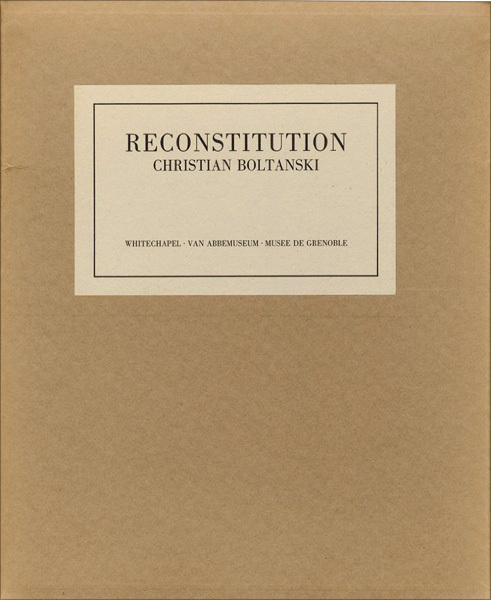 Christian BOLTANSKI: Reconstitution. French Edition. 1990. Set of catalogues by the curators and C. Boltanski's artist books and various documents re-printed in facsmile on the occasion of the show. In a card box. Essay by Serge Lemoine in French: "Photographies, lampes de bureau, boîtes de biscuits: propos sur l'art de Christian Boltanski" / Reconstitution (foreword by Catherine Lampert, Jan Debbaut, Serge Lemoine and an essay by Lynn Gumpert in French: "The many faces of Christian Boltanski") / Interview G. Marsh - C. Boltanski in French. This French edition, including the essay by Serge Lemoine, is rare. 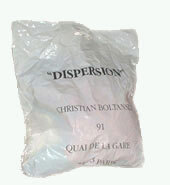 White plastic bag, with text: - "Dispersion, Christian Boltanski 91 Quai de la Gare 75013 Paris" - printed on both side. 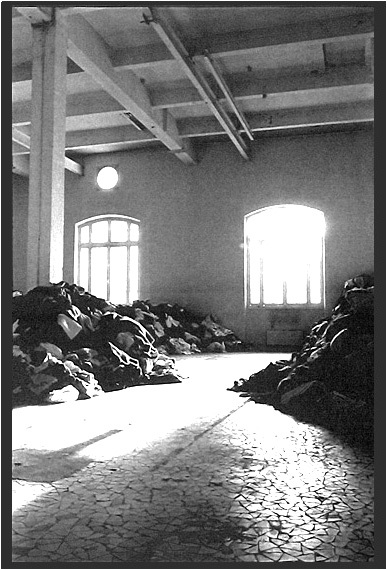 Part of the exhibition: Christian Boltanki had installed huge piles of secondhand clothes in a large empty room, Quai de la Gare, Paris. Visitors had to take one of the empty plastic bags placed at the room entry, fill it with some of the clothes and leave with it, "dispersing" the secondhand clothes pile. 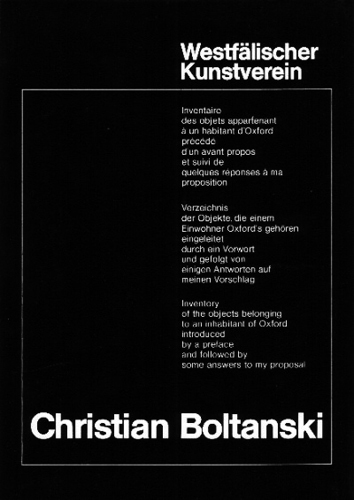 Christian BOLTANSKI: Livres. (The "Black Box"). 1991. 35 x 25.5 x 5.5 cm. Box containing 28 different items, including a single-record "Reconstitution de chansons qui ont été chantées à Christian Boltanski entre 1944 et 1946", 1971, artist books, photos, etc. Facsimile reprints, except "Sans soucis", 1991; "Monuments", 1986 in first edition. Contents: "Recherche et présentation de tout ce qui reste de mon enfance", 1969. "Reconstitution d'un accident qui ne m'est pas encore arrivé et où j'ai trouvé la mort", 1969. "Photographie de la soeur de l'artiste en train de creuser sur la plage," 1969. "Tout ce que je sais d'une femme qui est morte et que je n'ai pas connue," 1970. 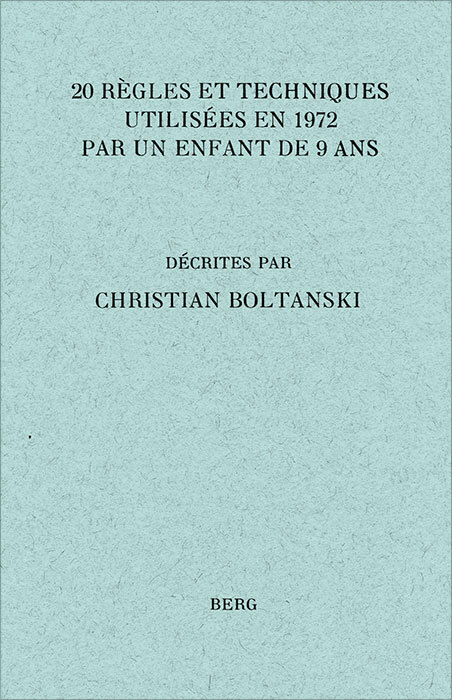 "Christian Boltanski à 5 ans et 3 mois de distance", 1970. - "Christian Boltanski et ses frères", 1970. 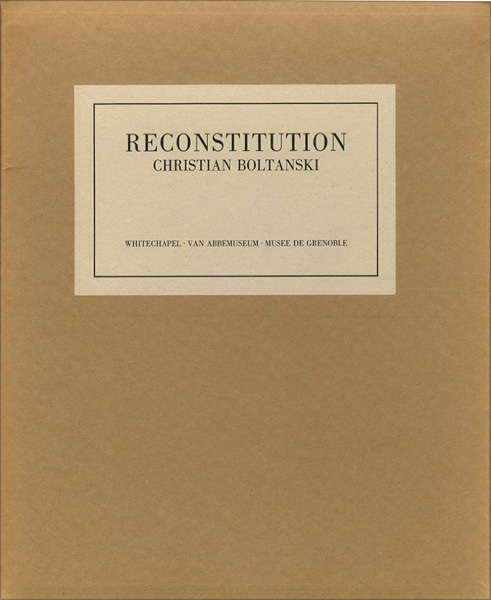 "Reconstitution de gestes effectués par Christian Boltanski entre 1948 et 1954," 1970. "Carte de maladie," 1971. "Catalogue: Essais de reconstitution d'objets ayant appartenu à Christian Boltanski entre 1948 et 1954", 1971. 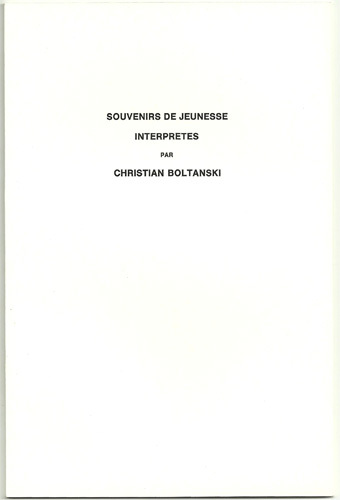 "Six souvenirs de jeunesse de Christian Boltanski", 1971. "Récit-Souvenir", 1971. "Reconstitution de chansons qui ont été chantées à Christian Boltanski entre 1944 et 1946", 1971. "Musée Social: Dispersion à l'amiable du contenu de trois tiroirs du secrétaire de Christian Boltanski", 1972. 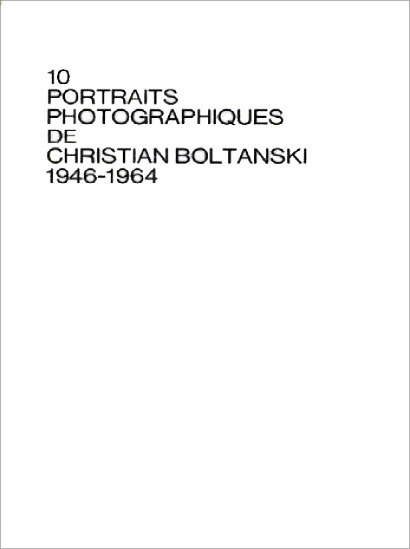 "10 Portraits photographiques de Christian Boltanski 1946-1964", 1972. "Je me permets de vous écrire", 1973. "L'appartement de la rue de Vaugirard", 1973. "Les Histoires", 1973. - Christian Boltanski a l'honneur de vous faire ses offres de service", 1974. 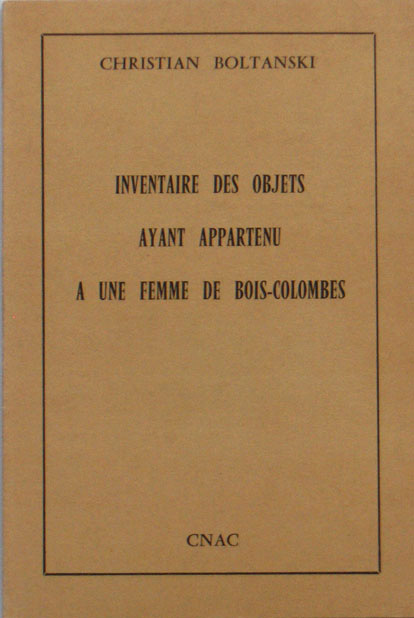 "Inventaire des objets ayant appartenu à une femme de Bois-Colombes", 1974. "20 Règles et techniques utilisées en 1972 par un enfant de 9 ans, décrites par Christian Boltanski", 1975. "Saynètes comiques", 1975. "Monuments", 1986. "Le Lycée Chases: Classe terminale du Lycée Chases en 1931: Castelgasse - Vienne", 1987. "Géo Harly: danseur parodistes", 1988. "El Caso", 1989. "Sans Souci", 1991. And the catalogue raisonne: "Catalogue. Books, Printed Matter, Ephemera 1966-1991" edited by Jennifer Flay, commentaries by Günter Metken, 212p. Limited edition of 900 copies. Complete. 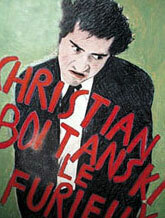 Christian BOLTANSKI: Livres. 1991. Livres. 1991-92. Booklet made of 4 colored postcards +1 text. Stiftsbibliothek, St Gallen, n.d. (1991-92). Colored photos of the Boltanski books and of the window cases in which they are exhibited in the St Gallen Stiftsbibliothek. Christian BOLTANSKI, Büchner C., Fischer A.: La Maison Manquante. The Missing House. 1992. 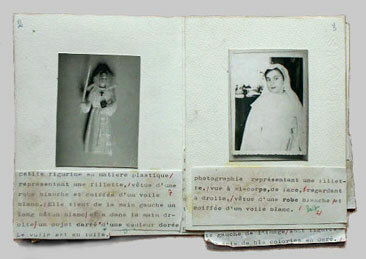 A card box (33.3x24x5.5 cm) containing seven paper folders: 1) La Maison manquante; 2) Autour de la maison manquante; 3) Ceux qui vivaient au 15, Grosse-Hamburger-Strasse 1930-1945; 4) Madame Kalies; 5) Kurt Potreset; 6) Monsieur Schnapp; 7) Le 3 Février 1945. Each, 33.1x23.8 cm containig numerous and various elements: photos, maps, etc. La Hune, paris, 1992. Edirion of 100 copies numbered and signed copies. J. Flay: C. Boltanski, Catalogue of the books, Printed Matter, Ephemera, König 1992, n° 78, pp. 204-207. Bob Calle: Christian Boltanski, Livres d'artiste 1969-2007, Paris, 2008, pp. 73-75. Christian BOLTANSKI: FEU, #4. (El Caso). 1991. Original work by Christian Boltanski. One-color lithograph on white Arches paper, 50x70 cm, printed on both sides, forming, when folded, 8 pages. Folded in four 35.5 x 25 cm. Issue #4 of the artist periodical FEU, Fall 1991. Feu, J. Daviot and B. Marcade ed., Paris, 1991. 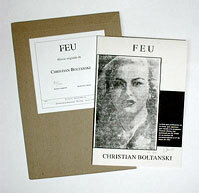 One of the 200 DELUXE copies, NUMBERED and SIGNED by Boltanski in black pencil. It comes with the original stiff paper envelope, bearing a paper label with printed title, names of the publisher and number in the edition, handwritten in black pencil. Each issue of this periodical is totally devoted to and realized by a single artist, who creates an original artwork. Christian BOLTANSKI: Liste des Suisses morts dans le canton du Valais en 1991. 1993. (62)p. Softcover. 21 x 14 cm. Published for the show "Les Suisses morts", February 14 - May 16, 1993. Musée Cantonal des Beaux-Arts, Lausanne, Switzerland, 1993. Bob Calle: Christian Boltanski, Livres d'artiste 1969-2007, Paris, 2008, p. 78. In a grey card folder: A sheet, "Acknowledgements" + 5 card folders: J. Hutchinson: "Death and the Duck-Rabbit" (4 pages of typed text); P. Bradley, C. Esche & N. White: "An Interview with C. Boltanski" (16 sheets of typed text on one side, stapled); Tramway, Glasgow: "Lost Property between March 1993 & Jannuary 1994" (8 sheets of typed text on one side, stapled); "Lost Property Records Cards" (4 sheets of b/w reproduced photos of lost property, 16 on each sheet); "Liste des Suisses Morts dans le canton du Valais en 1991" (28 sheets of typed text on one side, stapled) + 4 payroll sets + 4 installation postcards. CCA and Tramway, Glasgow, 1994. Bob Calle: Christian Boltanski, Livres d'artiste 1969-2007, Paris, 2008, pp. 84-85. Christian BOLTANSKI: Notícies del dia. 1994. Fundació Espai Poblenou, Barcelona, 1994. Bob Calle: Christian Boltanski, Livres d'artiste 1969-2007, Paris, 2008, p. 88. 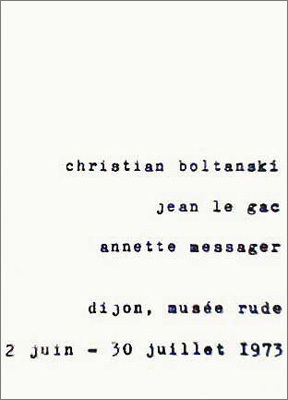 Christian BOLTANSKI: Plats du Jour. 1994. (12)p./colored pl. Text in French. Bob Calle: Christian Boltanski, Livres d'artiste 1969-2007, Paris, 2008, p. 77. Christian BOLTANSKI: Les vacances à Berck-Plage. (Août 1975). 1995. (36)p., 26 tipped-in original colored photos. Oktagon, Stuttgart, 1995. Edition of 500 copies. 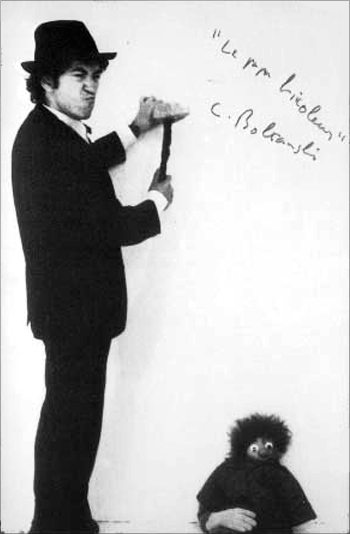 Signed in black pensil by Boltanski. Bob Calle: Christian Boltanski, Livres d'artiste 1969-2007, Paris, 2008, pp. 94-95. Christian BOLTANSKI: Clare, Sinèad, Orla, Aoifi. 1996. Published on the occasion of the 20th Annual Exhibition of Visual + Art, Limerick, Ireland. 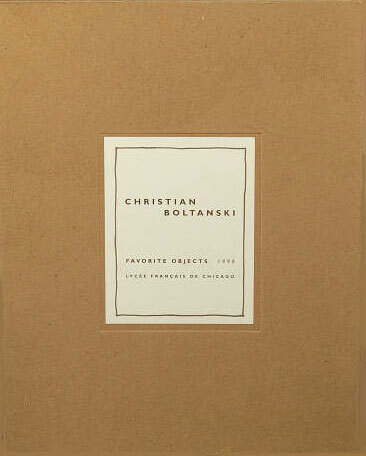 Christian BOLTANSKI: Favorite Objects. 1998. Brown cardstock box with printed label mounted on the lid. Contains reprinted images of the photographs of all the students' favorite objects from Lycée Francais de Chicago. Published by the Lycee Francais de Chicago, 1998. Christian BOLTANSKI: Le Monde. 1999. Artist original intervention on an issue of the French daily newspaper Le Monde. 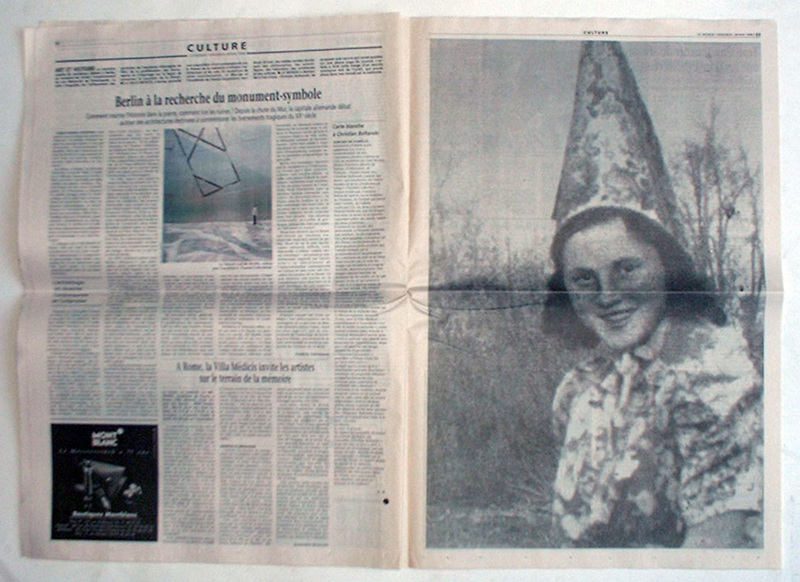 A full page/plate, b/w offset photo, of the French daily newspaper Le Monde of Friday May 28, 1999. Page/plate: 47 x 32.5 cm. Total pages: 38 + X pp. We are interested in purchasing artist books, multiples, prints and unique works of art by this artist. Nous sommes intéressés par l'achat de livres d'artiste, estampes, multiples et oeuvres uniques de cet artiste.